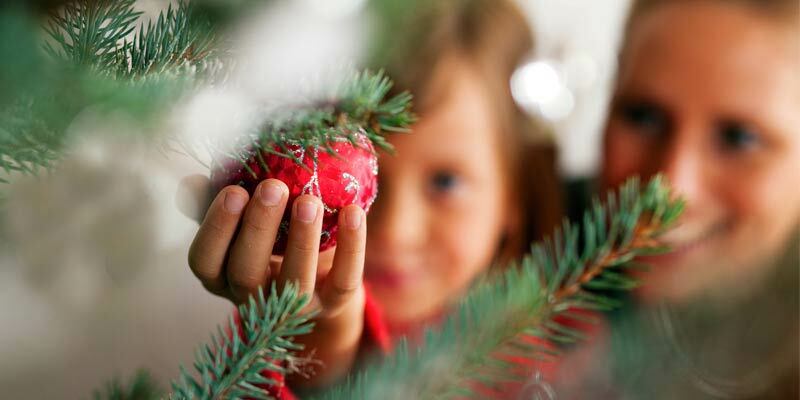 Do your kids love making Christmas ornaments? Mine do too! During the Christmas season, I am always on the search for easy Christmas ornaments kids can make. We try to make Christmas ornaments every year as part of our annual Christmas family traditions. Making homemade Christmas ornaments with the kids is such a fun time of creativity, and these easy Christmas ornaments turn out to be a wonderful Christmas keepsake! We try to make this annual kid Christmas ornament crafting time as stress-free as possible (because, let’s face it, none of us need more holiday stress)! That’s I wanted to share these ideas for 7 homemade Christmas ornaments our kids have made. Check out each of these 7 ornament designs! This post has pictures and instructions for each one! Want Super Easy Christmas Ornaments for Kids? If you’re looking for really easy Christmas ornaments that are mess-free and share about God’s love, then check out the Kids Ornaments to Color printables in the Christ-Centered Christmas Family Traditions System. 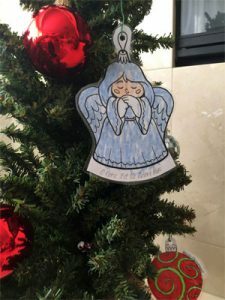 The adorable angel ornament to the right is only one of the four designs (each in three sizes) found in this awesome set of Christ-centered activities and resources. Not only are these ornaments adorably designed, each contains a special Christmas saying (the angel says, “O Come Let Us Adore Him”). Kids love coloring these, cutting them out and then hanging them on mini Christmas trees. This 143-piece system contains everything your family needs to create God-honoring traditions and family activities that share the true spirit of Christmas! The possibilities really are endless with these easy Christmas ornament ideas! Let your creativity flow and have fun! Ready for the first one? This Glitter Word Ornament is honestly my kids’ favorite of the bunch! The secret behind this ornament is… spaghetti! Yes, simply cook spaghetti noodles and drain them in a colander. Cut a piece of wax paper for each child. Rub a few drops of dishwashing soap over the wax paper in the area where you’ll be working. Then hand the kids the noodles and let them spell words! It will take them several noodles to link together to spell the word, or in some cases, even just one letter. That’s fine. Just make sure that all the letters are touching. Cursive letters seem to work better for this reason. Next, using your hot glue gun, draw a line of hot glue over the noodle, tracing each letter shape. Cover the letters with lots of glitter (it will stick to the hot glue). After the hot glue has hardened for a few minutes, tip the wax paper up a little and shake off the excess glitter. Next, peel the word off the back of the wax paper. If you find that a few noodles are still showing through, repeat the hot-glue-then-glitter-dousing process. Thread a ribbon through one of the letters and hang! The dishwashing soap-on-the-wax-paper trick is a must. If you skip this step you’ll be leaving me a not-so-nice comment about how your hot glue stuck to your wax paper and that the ornament was a major pain to peel off (not that I wouldn’t know about that or anything). It’s also best to use freshly-cooked spaghetti noodles. If the noodles are too dry or have hardened into a clump, they’re really hard to peel apart…and thus your letter-making will not be as fun. You don’t have to stick to letters and words! My kids got a little crazy and were making animals and snowmen and Christmas trees… well, you get the picture. P.S. Are you not a “crafty” mom, or are you short on time? Check out how easy and simple the Kids Ornaments to Color are in the Christ-Centered Christmas Family Traditions System! Place wax paper sheet over printed page of snowflake outlines. Rub a small amount of dishwashing soap over wax paper surface so that the hot glue won’t stick to the paper. Using the glue gun, trace and fill in the snowflake pattern with hot glue. Once design is completely filled in, immediately cover with glitter. Allow to dry a moment and then tilt the wax paper and shake off the excess. If you missed an area or if the snowflake looks lopsided, simply add more glue and then more glitter until you are happy with the look. Attach jewels to snowflake by adding a small amount of glue to the back of each jewel and pressing it into the snowflake. Allow to dry for a minute or two. Slowly and carefully peel the snowflake from the wax paper. To hang, tie a ribbon around one of the corners of the snowflake or pierce a small hole through the ornament and hang with thin wire or fishing line. P.S. Are you looking for DIY Christmas ornaments that are easy for younger kids who may not able to make fancy crafts? The Kids Ornaments to Color in the Christ-Centered Christmas Family Traditions System are a perfect fit! Check them out here. Gather plant or other organic clippings (evergreen materials such as pine tree needles or holly branches and berries work best). Trim material to fit inside globe. Place plant material inside globe, arranging it in an artful or interesting way. Paint a word on the outside (or use a rub-on element). Thread ribbon or wire through top and hang! P.S. Looking for DIY ornaments that kids can put on their own mini Christmas trees? Don’t miss the Kids Ornaments to Color in the Christ-Centered Christmas Family Traditions System! Paint entire ornament with chalkboard paint. You may need several coats to get a good covering. Let each layer dry in-between coats (use a hair dryer on a cool setting to make this drying process go faster). Paint on a small element such as a holly branch and berries (or add a rub-on element). P.S. Do you want DIY Christmas ornaments that are super simple, mess free and only require crayons? You’ll love the Kids Ornaments to Color in the Christ-Centered Christmas Family Traditions System! Learn more about this amazing system here that gives your family the joy of a Christ-centered Christmas! Paint entire ornament off-white using acrylic paints. Allow to dry (use a hair dryer on a cool setting to make this painting-then-drying process go faster). Paint silver lines in the ridges along the sides of the ornament. Allow to dry. Wet the sponge and wring out all the water (you want the sponge expanded and soft but not wet). Lightly dab the sponge in the gold paint. It’s important to have only a little paint evenly spread across the surface of the sponge. If you have too much paint, simply dab it off on a piece of paper. Using light strokes, add an antiqued look to the ornament by dabbing the sponge all over. You just want a light look that adds a layer of texture. Allow to dry. Apply a thin layer of Mod Podge to the ornament in the areas where you want the glitter to be (notice I did mainly the top and a little down the sides in a few places). Sprinkle glitter liberally on the Mod Podged areas. Allow to adhere and shake off the excess. Attach jewels to ornament using quick-drying glue. P.S. The Kids Ornaments to Color printables (see them here) are just one part of a collection of activities (such as a 30 day Bible Countdown and 30 Christmas Acts of Kindness) to allow your family to have a simple holiday season that focuses on the birth of Christ. Hundreds of families are loving the Christ-Centered Christmas Family Traditions System! Learn more here. Starting at the top of the ornament, paint swirls and squiggles using the acrylic paints and brush. Make a few longer than the others. Remember, less is more here. Allow paint to dry. Using a hot glue gun (set on low heat) trace the pattern of some of the painted swirls and squiggles with hot glue. Working in sections, apply the glue and then immediately douse with glitter. Allow to dry, then shake off the excess glitter. Apply beads or jewels to ornament using hot glue on a low setting. P.S. Looking for ornaments that tell about the true Christmas story? You’ll love the Kids Ornaments to Color in the Christ-Centered Christmas Family Traditions System! Learn more about this amazing system here that gives your family the joy of a Christ-centered Christmas! Take the top and hanger off the ornament, creating an open hole at the top of the ornament. Squirt about a dime-size worth of paint inside the ornament. Try to allow the different colors of paint to puddle in different areas. Then, holding the ornament at its base, gently turn it around, allowing the paint colors to mix and swirl. Keep gently turning the ornament until the desired pattern is achieved. Once pattern is achieved, allow ornament to dry in an straight, up-and-down manner. The paint inside will be wet for some time and will continue to move and make patterns if the ornament is not allowed to be left alone to dry. P.S. Want ornaments that can be not only be beautiful decor for Christmas trees, but also can be used as Christmas tags? Each of the 4 designs in the Kids Ornaments to Color Collection inside the Christ-Centered Christmas Family Traditions Printables has three sizes so you can decide which would be the best fit for your use. Check them out here! Enjoy these kid made Christmas ornaments and this precious time making memories with your family this holiday season! And of course, don’t forget to check out the Christ-Centered Christmas Family Traditions System! You’ll love its step-by-step approach to an easy and simple family Christmas centered around God!